We all know food portion sizes play a huge role in our efforts to achieve our ultimate health and fitness goals. Most of us eat too much food and the wrong kinds of food. 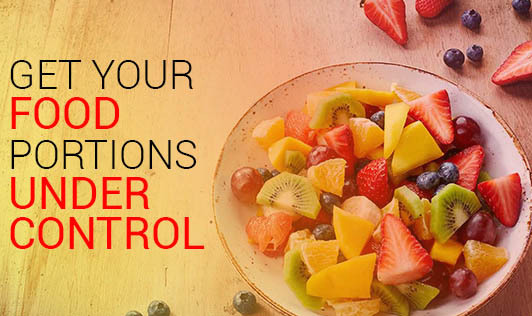 Food does not have to control us; we need to learn to control it. The first step to obtaining this freedom is learning to control portions which will help in cutting back on calories and losing weight. • Measure everything using measuring cups, spoons, or a food scale. Another important thing to keep in mind is that practice makes perfect. With time eating standard portions will become a second nature as eyes and brain get used to eating smaller portions. • Use everyday household items as a guide to the amount of food you should be eating. Example - A serving of rice should be about the size of a tennis ball. A serving of vegetables, the size of a baseball. • The plate method. This involves using an eight inch plate and dividing the plate in four. One half of the plate is for vegetables and if you so desire fruit. One quarter is for your starches - rice, roti, etc. The last quarter is for your non-veg or dal. • The bigger the plate, the more food you're likely to put on it. Instead of using huge dinner plates, mega soup or salad bowls, and enormous glasses, use smaller salad plates, shallow soup bowls, and short glasses for your food needs. Eating with a small spoon rather than a large soup spoon will help you eat more slowly and savor your meal. • Shop wisely, look for healthy snacks. Prepare them in handy snacking sizes at home. • Eat high quality, low quantity. • Shut the TV or computer - Watching TV or working on the computer while you're eating can lead to eating more food. Your plate might be clean before you realize that you've eaten a meal. • While eating out, order for less number of portions than the number of people dining. You get to share the dish and tend to eat less.